BANAV BIBI IS NOT A BANGLADESHI. She wants everyone to know this. She shouted it to the policeman who accused her son of being an illegal immigrant, arrested him, and beat him up. She said it to the rich madam-ji in one of the homes from which she picks up trash, when she was accused of stealing and not allowed to enter. And she told the jamadarni, the neighbourhood head of the waste collectors, who hired goons to run her out of the area. If they want proof, they can look at her identity card. 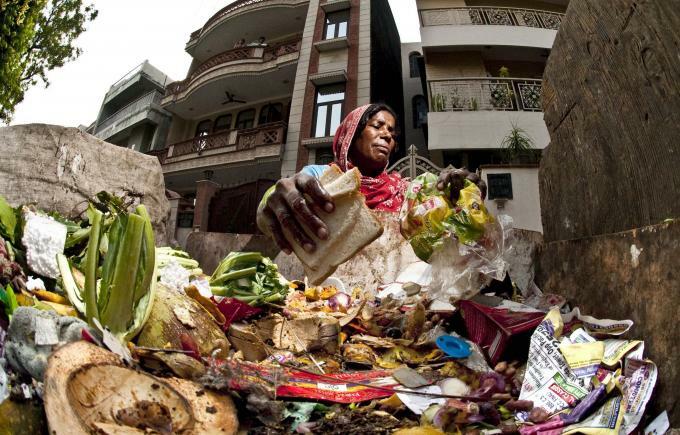 Bibi, a door-to-door garbage collector and wastepicker, sorts through trash near the Seemapuri slum in East Delhi. She’s collected it and transported it 16 kilometres from one of the homes on her route in the D-block of the posh Sunder Nagar colony, in South Delhi. Plastic bag, yes. It will sell for five rupees per kilogram. Scraps of paper, yes. 1.25 rupees per kilogram. Glass, one rupee per kilogram. Tin, two rupees. Packet of chips. No. Some kinds of plastic just won’t sell.